If I was only able to ever buy one kind of chocolate bar forever, then a Snickers with its sweet salty nutty taste would win hands down. The ingredients are extremely simple and if you don’t want to opt for a plant based milk, swap for milk and same with the syrup… swap for granulated sweetener or honey if you wish. 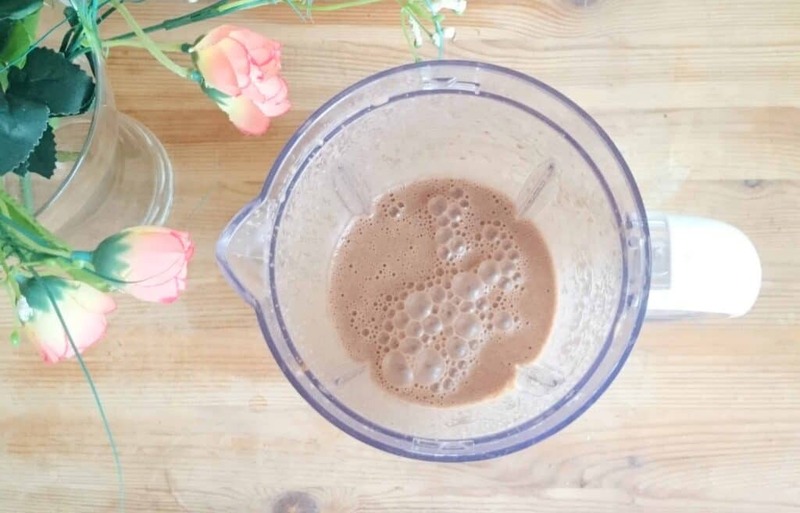 In one of my more recent posts, I received a £6 Tesco voucher in the post and not wanting to spend much on “just a blender”, although secretly I wanted a nutribullet, I bought Tesco’s rock-bottom basic one and it works perfectly for my needs. I’ve made a few random delicious smoothies on an evening but annoyingly have been too lazy to jot the ingredients down and from experience, nothing beats natural daylight for food shots. So I’ve let a few recipes slip, but not this one! Talking about nuts, I oddly used to hate them and when I waved bye bye to my 100% vegan days at Uni, it was from this point onwards where I wasn’t repulsed by them any more. Now, when I want nuts, I don’t hold back and listen to my body. Natural nuts are full of protein and so good for you, if eaten in moderation of course like most things (and it’s the moderation part I unfortunately don’t do), so I only buy peanuts at Christmas or if someone’s offering. As for a decent and reasonably priced jar of natural peanut butter, I finally bought myself Meridian’s 100% nuts peanut butter with no palm oil and for the first time, I saw it at 1.99 in Tesco. 1 tsp milled linseed (for omega 3 & protein) which I forgot to include in the pic above! Just chuck everything in to your blender and whiz away! I hope you enjoy & I cannot wait to create more smoothie recipes as I think I’ve done soups to death until the weather starts to turn later in the year. Rounding it up, I think smoothies are now officially now my new Recipes of the Week on my YouTube Channel and this is no exception and will be LIVE tonight! Let me know if you love it too in the comments below.